Among the stellar musicians at our 2014 Fiddlers’ Showcase Concert at Northwest Folklife were fiddlers David Cahn and Bill Meyer, aka the ‘Billbillies.’ Harley and Shera Bray and Nancy Katz rounded out that fine band. Among the stellar musicians at our 2014 Fiddlers’ Showcase Concert at Northwest Folklife were fiddlers David Cahn and Bill Meyer, aka the ‘Billbillies.’ Harley and Shera Bray and Nancy Katz rounded out that fine band. David and Bill have been egging each other on since 1966 when they met as students at the University of Michigan. By the time I heard them there in the early ‘70s they were pretty darn amazing, and quite inspirational to me. These two multi-instrumentalists performed together in the Argo Pond String Band and assorted combinations back then and, since the early ‘80s, many other bands in the Seattle area and beyond. Bill hailed from Holland, MI, not far from my home in Kalamazoo, and David spent his formative years in New York City where he began his studies of old time and bluegrass music with local musician, Ben Rifkin. On fiddle he particularly gravitated to the fiddling of Clark Kessinger, Tommy Jarrel and Dan Gellert (Indiana fiddler whom I also heard and danced to when I was a teenager). During their Ann Arbor years David (and Bill) recorded and performed with such notables as Helen Carter and Wade Mainer. 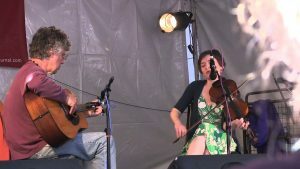 More recently they both have toured and recorded with famed New England contra dance fiddler Rodney Miller, as well as many other great musicians. David’s band, The Queen City Bulldogs (with Armin Barnett also on fiddle), won a first place prize at the 1994 string band contest at Clifftop, a well-known festival in W. Virginia. Most importantly though, as far as this fiddler is concerned, David has been one of my closest friends since his move to Seattle and has joined me, and occasionally our WOTFA regulars, on stage at many a show or a dance – guitar, fiddle, banjo, mandolin, button accordion etc. etc. He is a popular teacher and a regular on the staff at the Festival of American Fiddle Tunes in Port Townsend, the Puget Sound Guitar Workshop and my own production (well, Sarah Comer’s, with my assistance), Winter Fiddle Fest at Icicle Creek Center for the Arts in Leavenworth, WA. Big Con, one of many excellent compositions from David’s fertile imagination, came about after he attended a 1993 concert in Seattle by Bill Monroe aka ‘Big Mon’ – also the name of one of Bill Monroe’s tunes. He played it for Rich Levine and me the other day and I was hooked. I wake up in the middle of the night humming it and play it whenever I get a chance. The transcription is mostly as David wrote it out some years back and is a good representation of the core tune. You will hear on the recording that there is, as always, lots of nice potential for in between notes and rhythmic play – enjoy. That’s David on the mandolin, Rich on guitar and yours truly on fiddle.